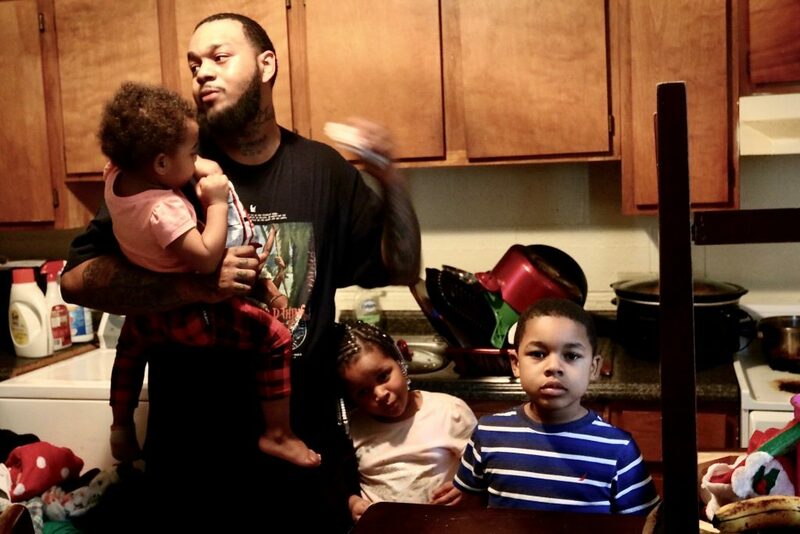 A heating crisis in Richmond’s public housing has local families struggling to stay warm during this brutally cold winter. Residents alleged decades of mismanagement by the Richmond Redevelopment and Housing Authority, which was created in 1940 to administer and manage housing for low-income city residents. 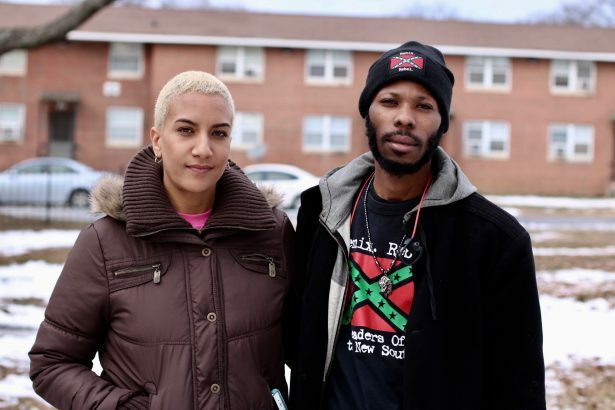 “Welcome to poverty,” Sha Randa Taylor said, inviting us into her home in Creighton Court. Like her neighbors, Taylor’s home was neat and tidy, but suffered from neglect and maintenance problems that she says haven’t been resolved. The 31-year-old was born in Highland Park, in the Northside neighborhood of Richmond, and works as a nurse, which makes her monthly rent $800 for a unit she can’t live in due to heat and health issues. 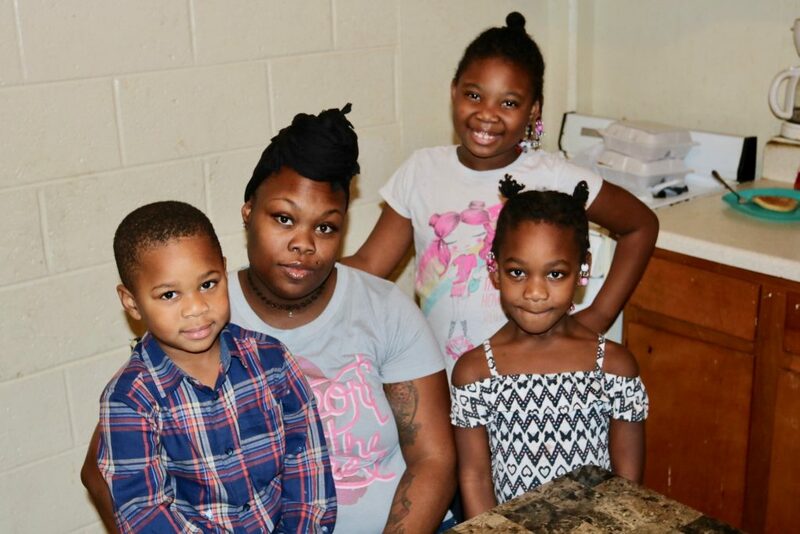 She’s lived in public housing for the first time over this last year after a high-risk pregnancy and subchorionic hematomas temporarily took her out of work, resulting in an eviction. Taylor said the whole block of housing was out of heat. “Touch the walls, they’re cold,” she said. Even bundled up for outdoors, her house was uncomfortably chilly. She was our last visit on a tour of four Richmond housing courts, led by local activists Omari Kadaffi and Chelsea Higgs Wise. The two have been highlighting unbearable living conditions citywide and working with residents to improve conditions. For Taylor, and the other families we met, it’s not just the heat. We saw evidence of a rodent infestation at Taylor’s home despite her clean floors, carefully packaged food, and minimal furniture, and she said her doctor told her the rodent droppings are making her sick. Like many of the people we visited, she’s been staying with family to stay warm, and is deeply unhappy with the authority. “They laughed at me,” she said, detailing an earlier visit to the rental office, during which workers called the police on her before they finally agreed to give her two space heaters, which were delivered during our visit. In Kadaffi’s words, it’s “planned blight,” a view he supports by running through the history of public housing in America. Lowest bidder construction and placement on the other side of highway systems that cut across cities set the stage for isolated, low-quality, walled-in living conditions. Recent mismanagement at RRHA saw the authority slapped with a $6.5 million bill for ineligible or inappropriate spending, and news reports have covered years of financial impropriety at the office. The Richmond NAACP had the same question, which they’ve discussed on conference calls, at a rally Monday night, and in a general meeting on Tuesday. Local NAACP president James “J.J.” Minor said, “We’re demanding a full accounting and timeline of the situation.” He shared plans for an official letter and a town hall meeting they’ll organize over the next ten days. The group anticipates bringing together some 400 residents and activists to put pressure on RRHA to prevent another heating crisis, and Minor says they will request a detailed analysis of infrastructure problems and a proposal to fix them in a timely fashion. For their part, RRHA claimed that senior management didn’t know about the issue until October 2017, but admitted that lower-level staff members knew about the problem sooner. NAACP meeting attendees were skeptical and unhappy with the response, which has largely consisted of 2-3 space heaters per unit and offers of hotel rooms to only a small number of those affected. Minor invited Lt. William Andrews of the Richmond Fire Department to speak to the safety and proper use of space heaters. “Electric space heaters should be for short-term usage or just supplementary,” Andrews said, confirming the fears of attendees. “These heaters aren’t for overnight use.” He also highlighted the high energy usage of the heaters. A single heater takes up most of the power on a single circuit, a big problem when a small home with only a few circuits needs three to maintain heat. If that’s the solution RRHA proposes, it seems to have left many in the cold. It’s been reported that seven of 49 families offered the opportunity to relocate have accepted, and some residents in Creighton Court were offered free hotel stays by Shamin Hotels, but of the residents we spoke with, none were offered hotels or enough heaters to warm their house. Although Creighton has been the focus for many local media outlets, we found units in Gilpin, Fairfield, and Whitcomb courts that also didn’t have adequate heat. Michelle Jennings, an author and behavioral specialist living in Gilpin Court, said a maintenance worker lectured her for using her oven for heat when they finally got to her house. “He says, ‘you’re not supposed to do that.’ ‘Well, I got little ones here, and it’s cold,” she said. She had space heaters, but they were taken away just before the cold snap. Jennings is one of many residents on an interactive map Kadaffi maintains, listing 39 units in addition to the known problems at the 54 units in Creighton. As we visited the people on this map, we found the same problem citywide. Madison Scott was one of those residents. Scott lives in Fairfield Court with his three children, but he’s had to send them to relatives on the coldest days, splitting up his family while he sleeps in the unheated unit. “They tell me they just don’t have the money to fix the heat,” he said showing us the gas oven he uses for heat. Like other tenants we met, he invited us to feel how cold the radiators were. In Whitcomb Court, Latoi Lyle said neither her oven nor her heat have worked since she moved in a year and a half ago. The oven leaked gas, a problem that took RRHA two weeks to look at after the Fire Department shut it off for safety, but one they still haven’t fixed. They’ve come out several times for the heat. “The heat comes on after they come, but it shuts off after 30 minutes,” she said, noting that she’s stopped calling them because while the workers are nice, they never fix anything, and she has to pay fees for their visits. Multiple attempts to reach RRHA for comment ended when I was transferred to full voicemail systems. The scope of the problem is currently unknown but seems widespread, and Kadaffi points to an official statement from RRHA CEO T.K. Somanath detailing problems in some 3,000 units that need to be addressed. 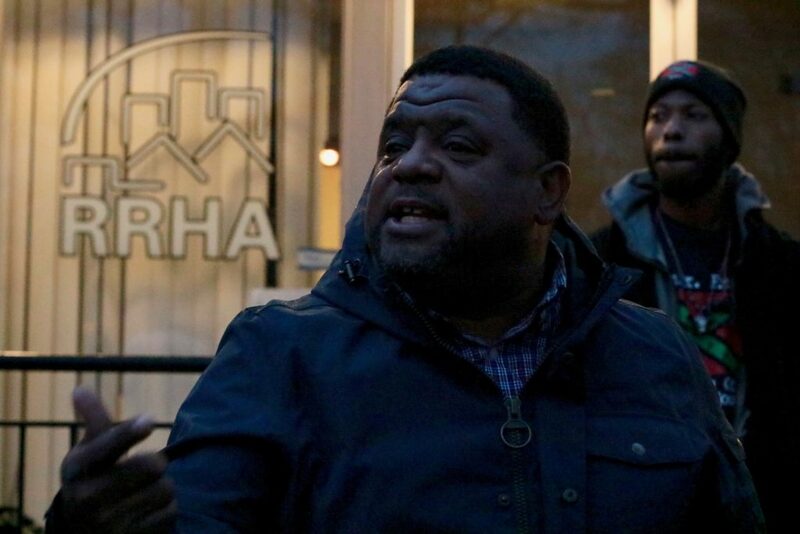 Many activists are unhappy with Somanath, including Maurice Tyler, one of the organizers of a rally that drew nearly one hundred concerned citizens to the doorstep of the RRHA offices on a cold, rainy Monday night. At the NAACP meeting, Tyler was unequivocal about Somanath. “He got to go,” he said, adding, “It’s not about him personally, it’s about doing the job. How many games do you have to lose before you realize it’s your coach that’s failing?” Like many at the NAACP meeting, Tyler told me he wanted to see a proactive approach with an increase in oversight of the RRHA. A proactive approach is exactly what political leaders are calling for too, from Congressman Donald McEachin’s official statement to my conversation with Agelasto today. “I do have confidence that they’ll do the best they can right now because it’s become a very big issue,” he said. But he said the only solution involved Somanath’s replacement.